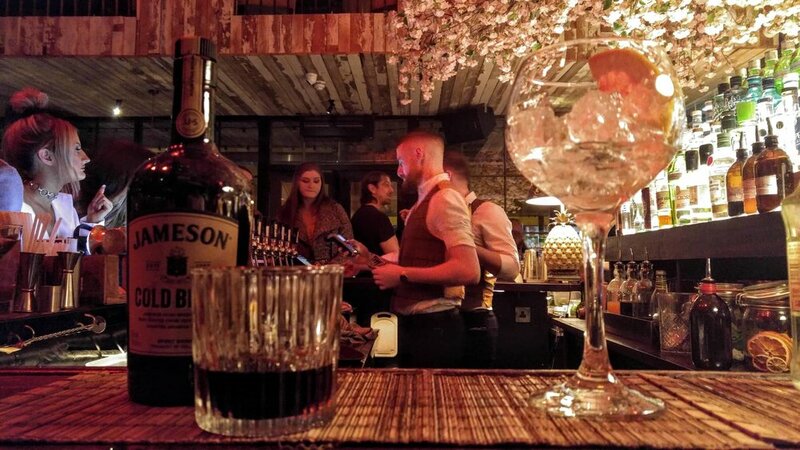 When you walk into House Belfast - a multi-use hotel and bar space - you’re met with at least a few people if not a whole crowd and a big blushing cherry blossom tree shooting out from the bar. Even if you don’t like crowds, you won’t mind because you’re standing under a big pink tree at the bar. If this bar didn’t not have a big pink tree coming out the middle, not so many people would come in, and they would walk by the building, ignoring the few people sitting at the normal whatever bar with no big pink tree. Did I mention there’s a huge glorious magic tree??? It’s man-made, as are the birds clipped to the branches. But it looks very real, and thats real enough for anyone. I come in with my husband and we stand behind a seated couple at the bar. We squeezed our way through to get there, no room to sit. The seated fat man at the bar keeps looking at me. Staring. When he isn’t staring at me, he’s rebuilding momentum to stare again in front of his angrily resigned girlfriend. Whenever I talk to my husband, the man’s face follows mine to watch us talk. He eventually stands up and gives me his chair. I take it. Why not? His girlfriend gets up to use the restroom, comes back and finds him talking to me after I’ve asked how long they had been there before being served, because the bartenders are not asking what I want. He says I have to be aggressive. I do know that, but some bartenders get annoyed and think you’re pushy cause they do see you and they’ll get to you but they’re busy with the 50 other thirsty people who came before you. The woman wants to leave. They leave. He comes back to remind me to be aggressive at putting in my drink order and then leaves again. I’m so thrilled to be in a great relationship where there’s no resigned disgust and reserved hopelessness amidst flagrant disrespect and tense non-communication. Once seated, a funny, lively woman my age slips in beside my husband and asks if he wants her to take our picture together. He said no, that my boyfriend would get jealous if he saw the pictures. He’s joking, I don’t have another partner, but the woman loved it and high-fived me and said that’s the way it should be. My husband and I are very clear about not cheating, so it’s fun to joke about it with strangers together. We told her we met on Instagram and she loudly cannot believe it and tells her friends. I am still conditioning my ears to catch every word in the Belfast English accent. Sometimes I smile and nod like they’re not speaking English. She was from an hour away and never makes it to this bar but it was her friend’s 40th birthday. We leave to eat a couple hours later and Chris gives her his card to follow him on Instagram at @coffeeanthropology. He’s a coffee anthropologist. People love to hear this because it sounds funny and they can’t image what he’s doing with his day as a coffee anthropologist, sitting around in coffeeshops doing “research? ?” Anyway. Aren’t these cherry blossom tree bar pics so stunning? I order two gin and tonics. The first with Bombay Sapphire. The second with Irish Gunpowder Gin. Chris orders a Jameson Cold Brew neat with a glass of ice on the side. The drink is a prototype and House Belfast is one of ten bars in Ireland carrying it. It’s so prototype, Jameson isn’t even sure if they’re actually going to launch it yet. Of course, being a coffee anthropologist, Chris has to taste it and photograph the drink 1,000 times for 5 minutes.